Who Was Nimr Al-Nimr, The Shiite Sheikh Executed By Saudi Arabia? : The Two-Way The kingdom's execution of Sheikh Nimr al-Nimr, who was highly critical of the Saudi government, marks a turning point in Saudi-Iranian relations and has sent shock waves through the region. An Iraqi protester holds a poster of Shiite cleric Nimr al-Nimr, who was executed in Saudi Arabia, during a protest Monday in front of the gate of the Green Zone in Baghdad. Saudi Arabia's execution of leading Shiite cleric Nimr al-Nimr on Saturday sparked a violent protest at the Saudi Embassy in Iran's capital, Tehran. Saudi Arabia then quickly severed ties with its longtime regional rival. As the broader Middle East reacts to the dramatic deterioration in relations between the two countries, which have long been strained, here's a look at who Nimr was. The cleric was an outspoken critic of the Saudi government, calling for more rights for the country's marginalized Shiite community. Saudi Arabian Shias say they're treated like "second-class citizens because they don't conform to the strict Sunni interpretation of Islam that defines the nation," as NPR's Leila Fadel reported from a mostly Shiite province in Saudi Arabia last year. "They can't hold high-ranking government or military positions, and they can't teach religion in public schools," Leila said. "From the day I was born and to this day, I've never felt safe or secure in this country," Nimr said in a speech in 2011. "We are not loyal to other countries or authorities, nor are we loyal to this country. What is this country? The regime that oppresses me? The regime that steals my money, sheds my blood, and violates my honor?" "He spent some 15 years in exile, returning in the mid-'90s. "After that, he was in and out of prison for calling for free elections and at one point he suggested that the Shia majority eastern province, Qatif, secede from Saudi Arabia if demands weren't met." 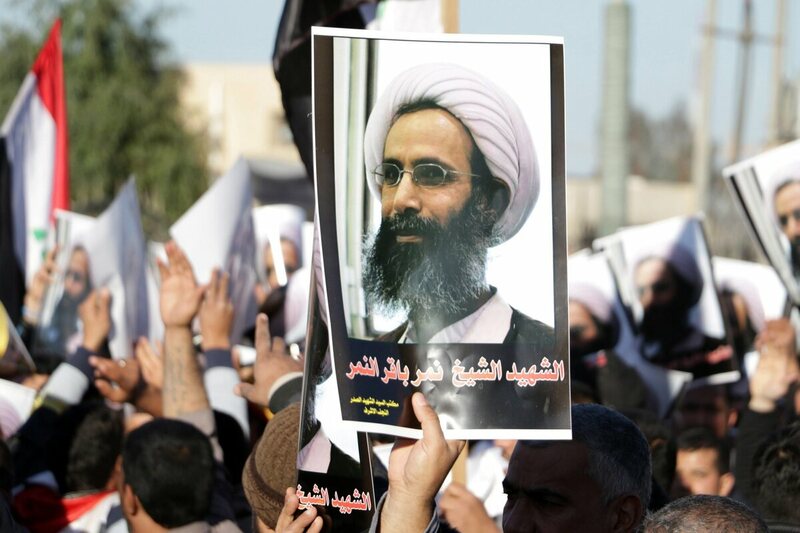 Nimr played a major role in demonstrations by Saudi's Shias in the wake of the so-called Arab Spring. At a protest in July 2012, he was arrested after being shot in the leg by police. "The cleric represents a more radical strain among Saudi Shiites, who feel the community's established leaders have failed to make headway with ending what they see as systematic discrimination," Reuters reported following Nimr's arrest. "Al-Nimr is currently gaining popularity locally, particularly with young people, as his words appeal to those disaffected by the general economic malaise experienced by Saudi Arabia's lower classes and a perceived lack of sufficient [Saudi Arabian government] reform in relations with the Shi'a community. Meanwhile, at a national and international level, with everyone from Salafi sheikhs to regional intelligence agencies, al-Nimr's words have gained him increased notoriety due to fears that his words will spark unrest and perhaps point to an Iranian hand in Saudi Arabia." Years later, "he would differ with Iran on the subject of Syria ... [and] he denounced the oppression of the Syrian regime, even though it's backed by Tehran," Leila reported.
" 'There is also a calculation,' says the analyst, 'the Saudis want to consolidate their alliances in the region — that would lead to a stark choice between the two sides.' "